Terror rippled throughout Boston law enforcement and government offices on January 31, 2007 as the city shut down major arteries and subway stations and called in bomb squads to investigate several battery operated signs posted throughout the city. The Associated Press writer Ken Maguire, reports that Turner Broadcasting had placed these devices all over Boston and nine other major cities in the several weeks prior in a marketing campaign promoting a popular adult cartoon. Joseph Sterling of the Boston University Police Department commented to this reporter that the BUPD had been aware of the devices for several weeks and had already removed several posted in and around Allston. 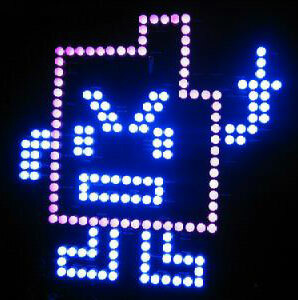 The devices featured lighted pictures of a cartoon character extending its middle finger. Up until January 31, these devices were regarded as litter and removed in the same routine manner graffiti and trash is removed from our streets every day. Why then, did these same lighted boxes ignite a citywide bomb scare on the 31st? To understand the reactions of the police department and Boston officials, we must consider the culture of fear that led to the gap in perception of risk posed by the boxes. The events of September 11 brought the consequences of terrorism to attention of the American public. This increased awareness as well as public perception of catastrophic danger derived from a man-made risk that is beyond our control. Media coverage provided personification of the risk by placing names and faces to victims. The continued failure of the US military to apprehend Osama Bin Laden contributes to an increasing sense of uncertainty. Attorney General Martha Coakley remarked at a news conference that the marketing firm hired by Turner Broadcasting should have anticipated the kind of panic that could be incited by the placement of such devices. The panic that did ensue clearly illustrated the fears of local authorities that Boston could be the target of a terrorist plot. Newspaper articles and televised news reports, repeatedly referred to a post-9/11 world. Indeed, we did learn much about our vulnerabilities as a nation that day. We saw the largest financial center of the nation topple and attempts made towards the destruction of the hub of our military intelligence. We saw carnage and destruction that would normally be censored from our programming. We met survivors in heartfelt interviews and saw full color photographs of countless men and women that perished in the attacks. All of this altered the way that we think about terrorism and our own security while contributing to our perceptions of our own level of risk. Each of these factors, although completely unrelated to the discovery of the marketing devices in Boston, colored the initial reactions of police and government officials. Rather than approaching the situation with the cognitive assertions that Boston is neither a financial nor a military hub and therefore an unlikely target for terrorist attacks, the general sense of fear that has steadily grown throughout the country initiated the fight or flight response in Boston authorities before the situation could be rationally evaluated. Professor David Ropeik of Harvard University Extension teaches his critical thinking students that this initial reaction of fear is natural and must be validated in order to assess any risk properly. Ropeik teaches the theories of Joseph LeDoux as published in his 1996 book The Emotional Brain to help students understand why it is in all of our natures to succumb to fear unnecessarily or excessively. The thalamus acts as a relay station in the brain, simultaneously sending information to the amygdala and cortex. Because of its proximity to the thalamus, the amygdala receives the signal 20 milliseconds before the rational cortex can respond. In this miniscule amount of time before the cortex receives the information, the amygdala signals the fight or flight response. This involuntary process occurs in all of our brains. The Boston police officers, detectives and bomb squads’ members are no exception. As mentioned previously, not all of Bostonians reacted to the electronic devices in the same way. To many image of a box with lights and wires conjures up the image of the roadside bombs recently brought to the American public‘s awareness through media coverage of the war in Iraq. Week after week, reports of roadside bombs felling armored vehicles flood our newspapers. While exposure to this risk is much greater in Iraq than in Boston, the awareness of such devices fuels the fear of any electronic device found near a roadway and provides images of a worst-case scenario triggering an emotional response to the mention of the phrase. Many of the younger generations responded quite differently to the boxes. These generations have grown up with electronics alongside them from the mobiles that hung over their cribs to the remote control carss that they drove around the house. I have spoken with several college students from Lesley and Harvard Universities between the ages of 19 and 27. The majority of these students said that the first idea that came to their mind when they saw the devices was of the electronic toy, Lite-Brite produced by Hasbro that was popular in the 1980s and early 1990s. This association caused these students to approach to the marketing devices with a sense of security and child-like fun. Jessica Heslam of the Boston Herald reported of one college student taking the sign down as a souevenir. This dichotomy of reactions illustrates just how much our perception of risk occurs at the emotional level. These students scoff the police department for their paranoia and complain that the ordeal has made a mockery of the city. In the aftermath of the bomb-scare, elected officials turned their focus to prosecuting those that placed the devices for perpetration of a hoax. The continued insistence by officials and the media that this was designed as a bomb scare has diverted attention from public discussion of the level of police response. Our attention should be focused on the critical thinking and risk assesment skills of our law enforcement. Perhaps Professor Ropeik’s course should become a requirment for Boson PD cadets.